I’m willing to bet that Mesa Arch is one of THE most photographed natural stone arches. It’s no surprise that thousands of photographers a year set their alarm clocks at some ungodly hour so that they can beat the crowd for sunrise. I’m not ashamed to admit I was one of them. 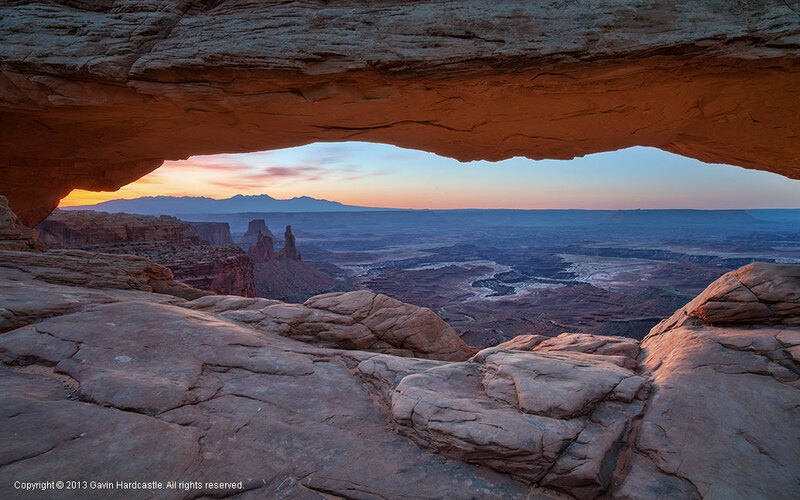 I think it’s because the arch creates a perfect frame for the spectacular view of the mesa below while the sun rises over the La Sal mountain range. If you can use a camera and the light is right you can virtually guarantee an awesome shot. That being said, it’s better to go prepared so here are my Mesa Arch Photo Tips. Canyonlands in Moab gets less tourism in the winter so you can expect less competition for the premium spot in front of the arch. You’ll also get better lighting angles when compared to spring because the winter sun will be placed more to the right of the arch. Winter will give you better atmospherics with a higher chance of mist and of course if you’re really lucky, snow! That being said, it’s stunning all year round. If you prefer a shot where the buttes to the left are wrapped in light rays then spring would be an ideal time, provided there’s plenty of moisture in the air. Stake out your position and claim it like a grizzly bear with cubs. I’m always amazed at how quickly people leave the scene after the sun does its business. While I was there we had about 20-30 other photographers lined up, gagging for a sunstar shot. Once they’d got it they all cleared out or started taking shots of themselves walking along the arch (don’t pretend you’ll resist the urge). By the time the arch had reached it’s maximum luminosity with the sun fully lighting up the inside of the arch most of the people had gone. I’d say this was a good 45 minutes to an hour after the sun first showed up. I was one of the few taking pictures long before the sunrise and long after it. The Zeiss 21mm Distagon was used to take this shot of Mesaa Arch in Moab, UTAH at f/11. Let’s face it, we’re all in the same boat. We just want to create a beautiful photograph we can be proud of. Nobody has any more right to this spot or that spot. The reality is however that some people can really take the piss. One of the shooters at my most recent visit had to be told off for being a pain but by and large most people are respectful. Just accept the fact that you can’t possibly have this place all to yourself and work with what you have. Be courteous to others but if someone is playing silly beggars be sure to let them know it’s not acceptable. Be nice and make some new friends. 5 – Cheat – If you can live with yourself. I may regret telling you this but I had a mini brainwave while at Mesa Arch. As I took my camera off the tripod and stalked around for compositional ideas I noticed that miraculously, people respected the personal space of my lone tripod. After 5 minutes nobody had muscled in on my little dot of tripod space even though my camera and myself were not present. It occurred to me that if I’d brought along a couple of extra tripods and placed them either side of myself I could have claimed a much larger space. Very wrong I know. I’m embarrassed for even thinking it. 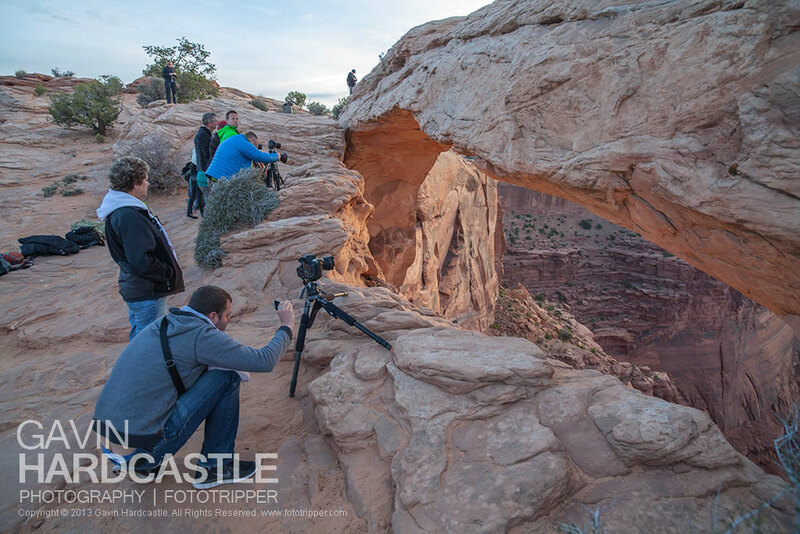 Forget I mentioned it, but If I see a line of vacant tripods next time I’m at Mesa Arch I’ll know the guy in the middle has been reading my blog! Busted. I think people overlook the fact the Mesa Arch is stunning at any time of day (and possibly night). Good light is good light regardless of the time of day, so if you get out there during a thunder and lightening storm or during an amazing sunset that lights up the easterly clouds, you’ve got yourself a work of art. Try some light painting and star trails at night or even a moonrise shot. If you could spend a whole week there what type of shot would you go for? 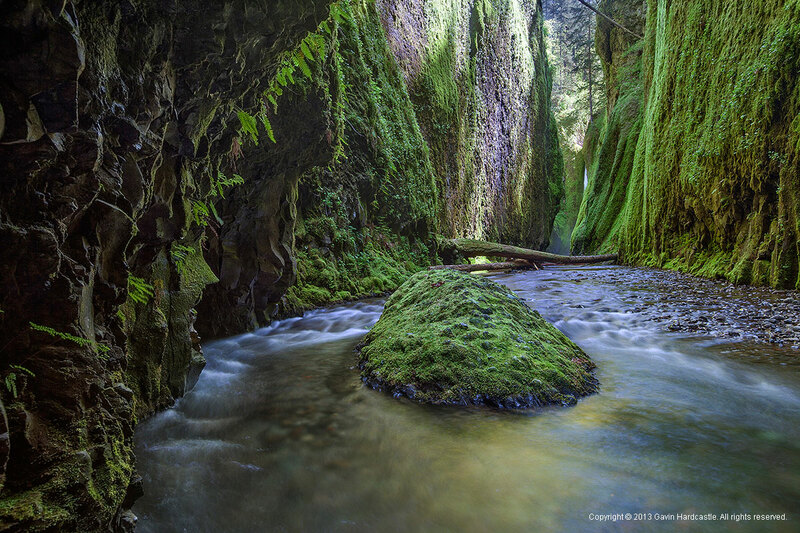 You’ll most likely be tempted to shoot a panoramic or stitch shot for ultra high resolution. Remember that most wide angle lenses create a lot of distortion which will mess up your stitching in Photoshop, so be sure to carry a lens that is 50mm and upwards. For this shoot I used the Zeiss 21mm Distagon wide angle lens and I had some serious issues trying to stitch the images together in Photoshop. I’d almost resigned myself to losing any chance of a usable pano of Mesa Arch until I discovered an app called PTGui which did a much better job than Photoshops limited ‘PhotoMerge’ function. It took me a while to learn the software but it was well worth it. I only had one repair job to do in Photoshop that was caused by parallax issues in my original photos. If Photoshop doesn’t cut it for you, try PTGui and do it right. Driving from Moab takes about 45 minutes if you drive at a decent clip. After stopping at the all night gas station for coffee, leave Moab on Main St North which becomes the 191 North and take the left on the 313 for Canyonlands National Park. This will become the ‘Island In the Sky Road’ and eventually ‘Grand View Point Road’. You’ll see the sign for Mesa Arch and the car park on your left. Watch for freezing temperatures in the dark, we were there in May and it was well below freezing in certain areas. It’s a super easy 10 minute hike from the car park to the arch. Take a headlamp so that you can see in the dark. I say ”super easy” but remember it’s at fairly high altitude. Tripod – Bring a weight bag in case it gets windy. Headlamp if you plan on arriving long before sunrise. If you don’t already know, Moab is a wonderland for photographers. There are literally thousands of spectacular photo opportunities in each and every one of the National and state parks. An entire lifetime is not enough to see all there is to see. Prepare to be completely overwhelmed. For amazing places near Mesa Arch be sure to check out ‘Island in the Sky‘ and ‘Dead Horse Point‘ which are very close by. Moab has accommodation to suite all budgets. We were cheapskates and stayed at the Days Inn. Let’s just say we’ll be staying somewhere more luxurious next time as I value the speed of my internet connection at all times. Each Park has a few camp sites but I expect they fill up quickly during peak season as they were pretty full while we were there in May. Book ahead to avoid disappointment. In Moab we had the best ever fish tacos at Cabo Grill towards the South side of Main St. I expect it was because of the bass from Lake Powell. The Sing Ha Thai was OK and the salads at Eddie McStiffs were great value. There are some great local beers but beware of the high alcohol content. Please leave comment and let us know about your best shot of Mesa Arch and your experiences there. If you have some unique perspective or tips on how to get the best shot please share with us. Are there really that many people t here? I’m going with a friend mid-October. I hate battling it out! But I will. Yes, it was a real test of patience in Spring but mid Oct may be quieter, however start preparing yourself mentally now. There are even more people than Gavin experienced. It was mayhem today! I would guess over 50 people filled the arch. One woman sat up in it to ruin the view for everyone. No one got a sunrise shot on Sunday October 8 that included the arch….just the sunrise because they were all so close. Ugh, time to find a new icon. I hope there are less people there, but I’m prepared to be there at 0300 to get the stars and then sunrise. Hopefully that’s early enough. Thanks for the warning. I’m assuming there are no bathrooms up there…. I seem to recall a latrine in the car park but don’t quote me on that. I confess to watering a few parched bushes. “Stake out your position and claim it like a grizzly bear with cubs.” Indeed! I’ve been admiring your photo stream, your photographs are a work of art! Thank you for your highly interesting info and tips..
My husband and I will be going to Utah next September, I’m attentively reading and taking notes of your tips. Thanks Gemma, be prepared to have your minds completely blown. I’ll be leading a Photography Workshop in Moab next fall so let me know if you guys are interested and I’ll send you the schedule. If you can move it from Sept to Oct the fall colours will be amazing. Hello Gavin, please send me the schedule, I will move the time from September to October as per your advise. I’m very interested in the Workshop. Myself and another photographer are going to the Moab area for a week of photography on Feb 1st. We plan on Arches, Mesa Arch, Horseshoe Bend and possibly Bryce if time allows. Really enjoyed your article about Mesa, if you could give us some tips about shooting that area it would be greatly appreciated. Most of the shooting tips you’ll need are in these pages but for February the best advice is to bring plenty of warm clothes and prepare well. Use a 4X4 vehicle and let people know where you are going. I have read several articles about warming filters in Arches. What filter would you recommend, the 81A or 81B or no filter. I’ve never used warming filters so I can’t say. My guess is you’d be able to achieve a similar result in Photoshop for free simply by selectively boosting the red/yellow highlights. Hi Gavin, I will go to Moab in early March, of course I will head to Mesa fro the sunrise. Have you ever been there in March? Do you know if there are so many people and if it still cold on like March 11? Thank you for sharing all your experience! Hi Shirley, I have not been in March but you should be able to find online records of weather conditions for the past few years. Like any location, you never know how many people will be there but I think it’s safe to assume you’d be extremely lucky to be the only photographer there. I was just here in early Feb. and arrived at the arch around 5am for a 7:15 sunrise and there were three photographers already there who had been shooting the stars. Those three people had five tripods amongst them all staked out and I silently cursed you :)! I did politely call them out on that issue and we were able to get along just fine. I think there is room for just one person in the ideal location for sunrise but everyone moved around with plenty of time to get great photos. Another 4-6 people showed up, got in the way, moved when asked and left quickly. We went back two days later during fog and found ourselves alone at the arch as the fog cleared! Also, there is a very clean toilet at the parking lot. Thank you very much for your advise, it was much appreciated. I had to laugh out loud at this. My little tripod tip might come back to bite me on the arse at a later date but its too late now, the secrets out. I’d love to see some of those fog shots, can you send a flickr link or something? I am an architectural photographer getting more into landscape photography every year. I have most of the equipment afterall. Just wanted to pop in and say your site is great and a pleasant read when I am traveling. As i am on a bus right now. Wish commercialy i had more time for work like this. Cheers. I would recommend bringing knee pads if you are composing low on a tripod and end up on your knees. If you bring a large container of coffee and a lot of cups you will have a lot of friends. I’m surprised at how close the group of photographers are to the arch, I would expect the photographers to be far enough back to get the complete arch and possibly zoom in for a closer shot. This has me rethinking what lens to take with me. I was planning on packing my 17-24 as well as my 70-200, or possibly instead of that one of my 85 prime. After reading this, however, I’m considering my 24 to 70, and 85. I have a 5D Mark two (full frame) and a 7D (crop frame). Going this Saturday. Any advise? As the crowds thin you’ll be able to use a longer lens but if you’re caught in the scrum (which grows ever larger each year) you’ll need super wide. It’s a wandering tale as to how I ended up on your site, but I appreciate your willingness to share your expertise. I’m purely a hobbyist, but continually try to up my game so your tips and tutorials are greatly appreciated! I’m headed to Arches and Canyonlands soon and am planning to shoot sunset, sunrise, and the hours between. 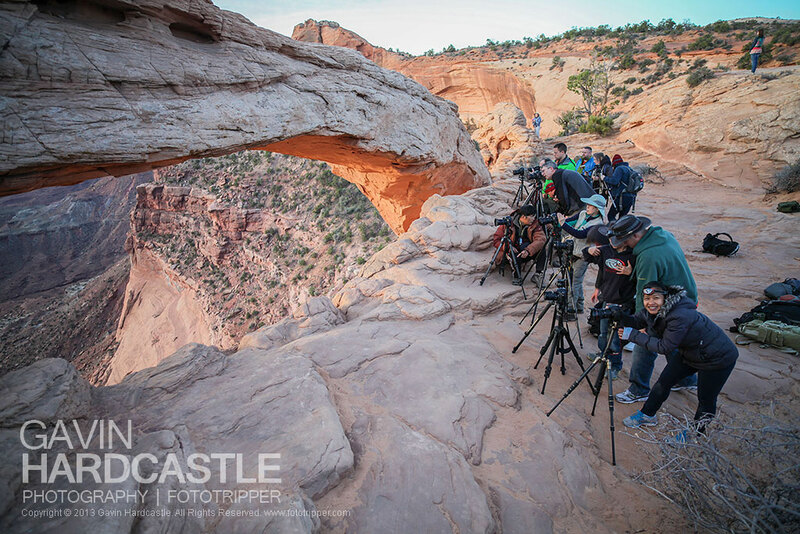 What lens is your preference for shooting at Mesa Arch? You can’t go wrong with a 16-35mm to cover the best focal lengths. If you had to pick one though I’d advise something wider than 24mm on full frame. What are the thoughts on mid June? I know I know, but looks like I have the chance to be out there from the East Coast at that time, and no flexibility. I expect it will be an insane carnival. I was going this weekend but now I’m thinking October because of the crowds. Thanks for the tips. Great photos. I read your post *after* my visit to the Mesa Arch but everything you described is still accurate. Didn’t notice anyone with multiple tripods, but all respected mine when I got up and got mobile. Great info overall. You can see my image on Instagram at @justinpatchin. Thanks for the tips. I was at Mesa Arch in September 2016. Not a good experience. Five or six of us photographers arrived well before sunrise and set up. Then a busload of tourists from another country arrived. Approximately 35-40. One set his tripod next to mine and would have knocked it over if I hadn’t been holding onto it. Then several of the group set their purses on top of my camera bag. I guess their “space” in their homeland is much smaller that in the US. To make things worse, the sun was behind thick clouds and a few drops of rain were falling. So, I am going to try again this winter and allow more time. And will wait until the crowds leave per your advice.